"Chocolate cookies with chocolate kisses hidden inside." In a medium bowl, cream together the butter and sugar. Stir in the vanilla. Combine the flour and cocoa, add to the flour mixture, mix until all of the flour is absorbed. Finally, stir in the pecans. Cover and refrigerate dough for at least 1 hour. Preheat oven to 375 degrees F (190 degrees C). Unwrap chocolate kisses. 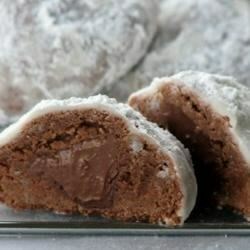 Mold about 1 tablespoon of dough around each chocolate kiss. Place 1 1/2 inches apart onto an ungreased cookie sheet. Bake for 10 to 12 minutes in the preheated oven, or until set. Cool on the baking sheet for 5 minutes before removing to a wire rack to cool completely. Roll cooled cookies in confectioners' sugar. The exact recipe from Hershey's web site. Excellent cookies. Awesome cookies! Will be added to my holiday cookie list. They turned out perfect. Thank you!